Before the departure from Denmark, I noticed an advert in the Harley Davidson club magazine, with an advert for renting a house i Florida. We contacted the owner, and agreed upon the rental, as the hotels we would have stayed on, would have been sigificant more expensive as we were a small group of persons. It quickly turned out to be the a good decision renting the house. 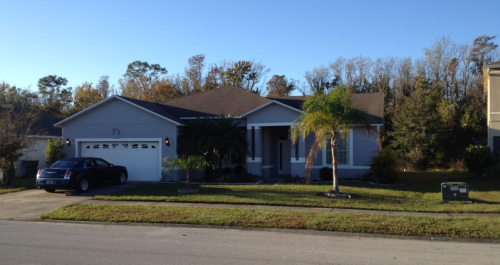 It was only 25 minutes from Orlando in Kissimme, and compared with Danish conditions, it is a luxary house priced at USD 750 pr week, and USD 99 for cleaning. Friday morning we picked up the almost brand new Harley Davidson Electra Glide 2015 model at Stormyhill a bit ourside Orlando. 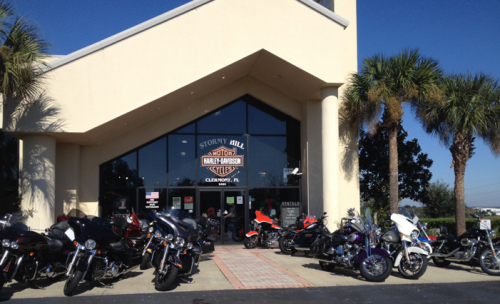 The reason for us to book the bikes outside Orlando was only due to our arrival on Thanksgiving Day, and the friday's Black Friday and no other than Stormy Hill's were open for picking up motorcycles. The price for renting the bikes were only USD 75 per day, but as we were not willing to take any risk in case of an accident, we signed up for all the extra insurance possible - and then it is worth noticing the price gets affected. We ended with USD 150 pr day, even our own risk were still on USD 1 000. We were of course pretty tired after the long flight and the 9 hours ride. But after doing a fast unpacking of our gear, we found a close-by bar/restaurant where we could by some food. It was nice and pieceful while waiting for the food, but together with the food, the local band got started and they played pretty loud and were placed next to our table. That could for sure speed up eating the food, and well back in the apartment, we could relax with a couple of beers. Next morning we got a nice surprice, as we realized our apartment had a great view with the ocean on the one side and the canal on the rear side. The view were fantastic. But in relation to the house in Orlando, the apartment was quite another style. 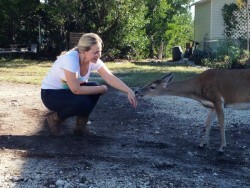 Further, we experienced that on the island of Marathon, it is necessary to look after the "wild life" as the entire island is an sanctuary for the deers, why they are so use to humans that they get really close. And they do not move automatically - not even for a noicy Harley. 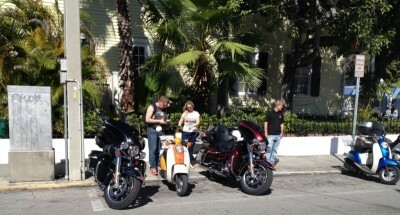 Saturday we got up early and hit the road towards Key West. The weather were now 25-28 deg C and sunshine - so after a quick evaluation the jackets were packed down into the top box, and quite unusual for us we were riding only with a "safety T-shirt". 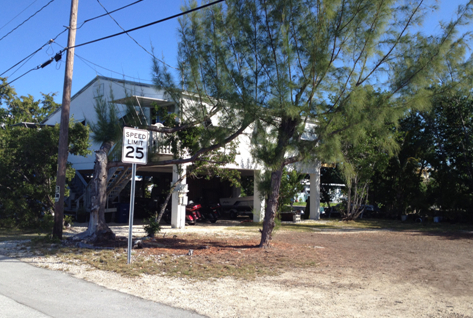 After approx one hours we reached Key West, whereafter we had a 3-4 hours seighthseeing by foot. 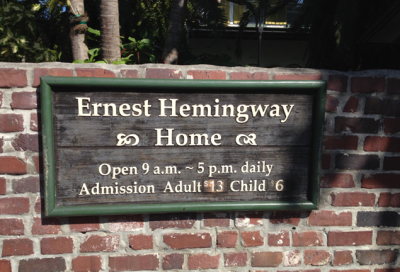 Among others we visited the home of Ernest Hemingway, the Southernmost point in the USA towards Cuba, and had a lunch on the loack Hardrock Cafe. Sunday we drowe back from Marathon towards Orlando, and the route we chose was on the west coast, why we went across Florida north around the Everglades. Of course we had to make a stop in the indian reservation - MICCOSUKEE - as we by coincidence passed by, and got tempted to try their riverboat after the dinner on the local fastfood restaurant. 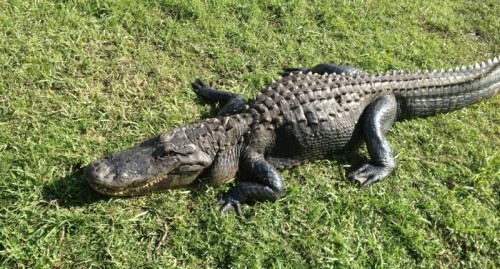 We succeeded seing three alligators on a small island where the riverboat stopped for a break. However, as we proceeded riding our Harley's we drove parallel with the swamps we saw several alligators and a few large turtles. The plan was to drive further north, as we latest Monday afternoon at 16h30 should hand in the rented Harley's. Therefore on the Sunday we rode ontil dinner, whereafter we started to look for a place to spend the night. We made a turn towards Bonita Beach and agreed to stay on the first hotel we passed. 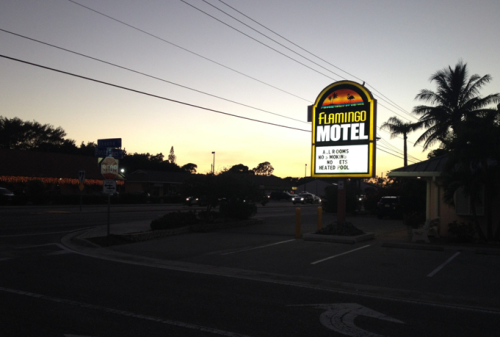 Well, that is how we ended up on Flamingo Motel. The motel itselves were luckely very nice, clean rooms, pool and including breakfast. The breakfast was not fantastic, but we enjoyed it outside under the palms. The price of USD 75 pr room were fair, as in each room were two double beds. Monday morning we took of from the Flamingo Hotel and chose riding as close to the water as possible, why we chose HIghway 41. The lunch was enjoyed on the local Hooters, just north of Port Charlotte. Then we got a bit behind schedule concerning handing in the Harley's before 16h30. Therefor we crossed Interstate 75 and continued on Interstate 4 to Orlando - as the sun were still shining, we rode in our "safety T-shirt" and with full speed ahead. At a certian point the GPS on the Harley's made us make a wrong turn. We are a bit surpriced that on a high-end motorcycle as the Harley Davidson, the GPS are of such a poor quality. We had a short stay on a small island towards Santinel, and had to go back. But, the view with water on both sides on the road were a fantastic place for a short break. The experience we made using foregien credit cards on petrol stations are not good. The usage of PIN code as in e.g. Europe are not widespread. So the procedure is just to insert the credit card and key in a fictive number - e.g. a ZIP code. A few placed we succeced using a random nunber 09400, as they requested a 5-digit figure. However, most places we had to go inside to the counter and after prepayment the pump were activated. Any surplus prepaid amount we got back instantly into our account and without any problems. Until 10 minutes before we should return the Harley's we had no problems. But, then the rain started... Then we had to make a quick stop and find the jackets before continuing to Stormy Hill's. The motorcycles should be returned with a full tank of fuel, but at the final petrol station there were so long que, we chose to pay a small fee not having filled up the tanks. To return the Harley's to Stormy Hill went absolutely seamlessly. Before we took off, the bikes were checked for damages were thorough, but upon return it was more to check we took all our personal belongings with us.